This is a do-it-yourself project I hope you'll be inspired to try, even if you barely sew. If you can sew a straight line, that's all you need! It's a definite "beginners'" project, I assure you. 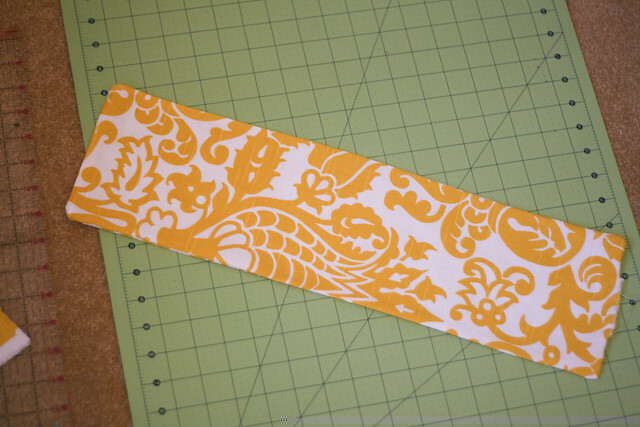 Cut 2 strips of pretty fabric. Mine were about 6 inches by 18 inches or so, but you can adjust to however large you'd like your heating pad to be. Pin the right sides together and sew all the way around, leaving a little opening to pull it right side out and to fill it with lentils. Fill with lentils. Or rice. Or whatever you have on hand. I filled my bag with 2 lbs. of lentils which was the perfect amount, then I added a few tablespoons of dried lavender (the herb, not the oil) that I had on hand. It smells sooo good. You could also put some loose leaf tea in there. Here's a tip for whatever size you're making: only fill it about half way full. Any fuller and it won't have much "give" to it. Once you've filled it, stitch the opening closed. 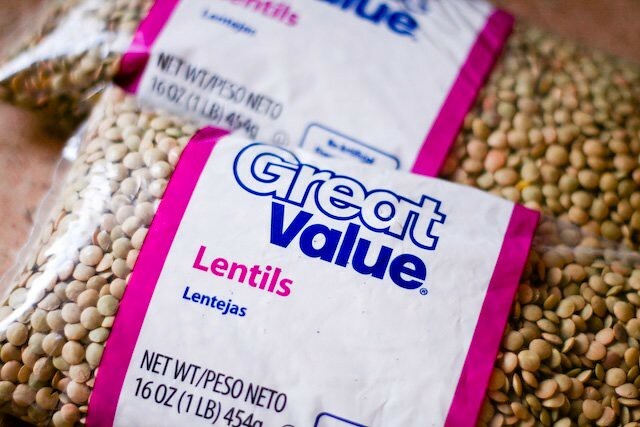 You now have a bag full of lentils, but if you move it around, the lentils will shift from side to side and it'll be a little annoying as a heating pad. So even out the lentils in the bag, then split the bag in half with your fingers. Sew down the middle, separating the lentils as much as possible so you don't sew into one of them. Then do that a second time: separate each half so that you end up with four little pouches of lentils. And that's it! 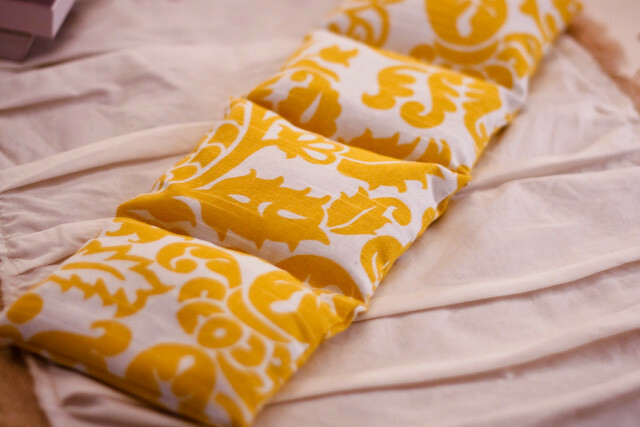 A beautiful homemade heating pad! Just heat it for about 3 minutes in the microwave and it's just perfect (and smells amazing). Also, this doubles as an ice pack! 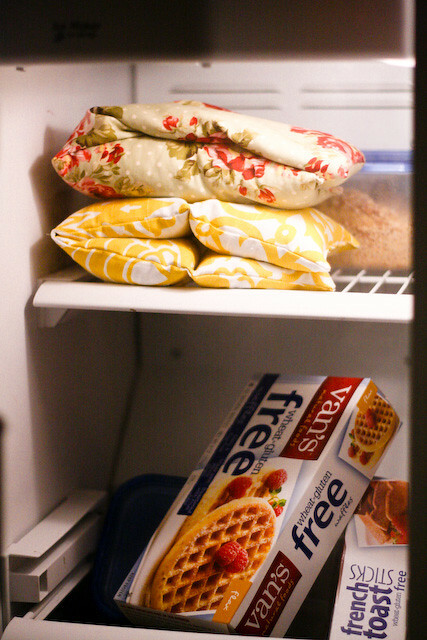 Toss yours in the freezer (it's where we store ours) and it's the perfect headache pillow. Just pull it out and it's cool but not too cold to put on your skin. Super comforting and smells delicious. 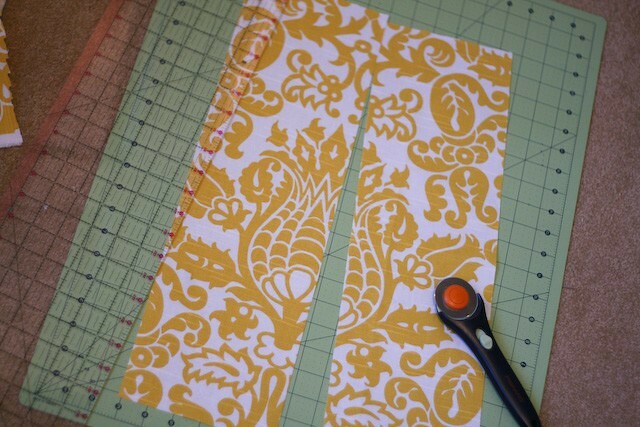 wow this does look like something I could attempt and hopefully be be successful at sewing! Thank you for sharing! So fun! I will definitely be making! THANK YOU! Stupid question but if you put uncooked popcorn kernels in it, and then you microwave it for 3 minutes, won't you have a bag of POPPED popcorn? If you want to use corn in the pillow, you need to use dried feed corn, like the kind you would feed chickens. 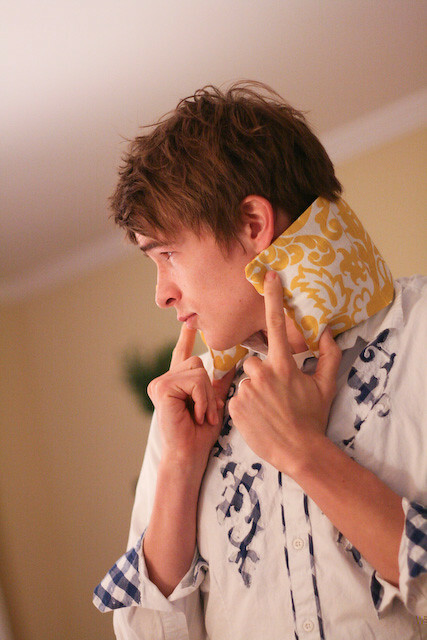 My daughter made some pillows like this for Christmas presents years ago (she was about 11). They were a big hit and they are still in use. When you put them in the microwave, it will smell a bit like warm corn, but it won't pop. We bought a huge big bag from the farm feed store for just a few dollars. This looks so easy. I want to try it soon. Beautiful blog btw. This is my first time here. Just saw this idea on pinterest! Such a great idea. Will be doing this for sure for neighbor gifts!! Your pictures were very good and I thought your explanation was so clear and thorough! Good Job!! So, I'm not a semstress, as a matter of fact my machine is in the basement in a box. I've been looking for the perfect project to start with, something simple. I've also been brainstorming how I could make my three boys (who don't like getting into cold sheets at bedtime) some little heating pads, microwaveable, of course. I don't think uncooked popcorn would work very well if you're going to throw this in the microwave. Just mentioning it before someone from the Sew, Mama, Sew readership hops over here and does an oopsy! Thank you so much for the tutorial! I followed from Pinterest. This was super simple to make and I am making for Christmas gifts :) I posted pics of what I made & linked to your tutorial on my blog. Let me know if that it NOT ok! I am planning on making these for my kids' teachers for Christmas. I think they all deserve them! Popcorn kernels don't pop in a microwave unless there is oil. Heating packs are often made of popcorn kernels. It's not a typo or an "oopsy." It works great, just FYI. Heck, three popcorn kernels will pop when a couple of cell phones are around them and calling each other. Check out video on utube. I wouldnt take any chances on using popcorn kernels! Hi Whitney from NZ I have made these before but haven't thought to use them in the freezer so will try, that. We always set a glass of water in the Micro Wave when heating them. The other thing we have been warned about is not to heat them to much to put in children,s bed as they have been known to go on fire just a wee warning. I had one given to me that was square with ties on it to hang on the back of a chair very useful. We put plain popcorn kernels in a paper bag in the microwave. It's the healthiest way to cook microwave popcorn- no oil is necessary! You could definitely use deer corn kernels, but popcorn kernels will absolutely cook/pop within 3 minutes. So I just looked it up - it's called "feed corn" but looks exactly like normal corn kennels. I guess that's what I used! That kind doesn't pop. I make differnt sizes of these and use wheat, rice, dry corn, there are several differnt things you can use, I've never tried it with lentils but I love this size and will make some like this. Thank you. I love these things. and they so take the chill off. Just popped over from pinterest. Flax seeds work amazingly too!! Thanks for the tutorial. Can I use brown rice? I made a small hand warmer with brown rice and when I microwaved it, it came out kind of damp. Is that normal? Popcorn pops because of the water in the kernel, not the oil that it's popped in. The kind of corn you would want to use is FEED corn from an animal supply type of store. Do NOT use regular corn. Rice, buckwheat, feed corn or lentils work the best. What a great tutorial!! I loved making these! Everyone who got one this Christmas was soo happy! Thank you! I make heating pads also and I fill mine with rice, flax seed, wheat, field corn from feed stores which smells like corn chips when heated so be carefu it might make you hungry (lol). It all works. They are great for a chilly night to just get warmed up. They work for little puppies, they love the heat from them. Many uses. Just stopped by from Pinterest and I can't wait to try this!!! do you have a print friendly version of these instructions? I love it! do you use lavender oil or how do you scent it? I don't have a print version, sorry. And I just use dried lavender! This is an awesome project, thank you for share it with us! Great idea. I will have to make one for me. I have a store bought one but its huge and sometimes I do not want my entire back hot. Will also be making smaller ones for the kids. Give them some extra heat next winter when we are walking to school. Live to close enough to find it silly to get in a car for the 3 minute ride but far enough to really feel the cold. My mom has made several of these using hand towels. However, she doesn't sew into the smaller sections. That's a great idea. I'll be sharing that idea with her as well as making that modification to the ones she's made me already. Thanks! My son just made this with Colts flannel and rice as a 4-H project. He added a few drops of essential oil (tea tree and lavender) and he LOVES it! He'll be submitting it as his Sewing For Fun project next week. He made his a little larger (finished project is 26 x 5). 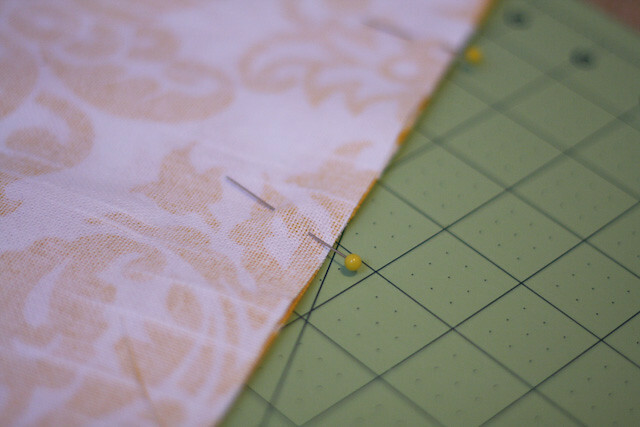 He used the serger to sew the long side and one of the short sides and finish the edge of the other short side, then folded the end under and stitched it closed. The rice feels a little stiff right now, and a little heavy, but since it's new, I suspect it will loosen up as it wears. Thanks so much for the tutorial! So glad to hear! Thanks for sharing!! Wheat hucks are lighter than the rice or corn and don't pack as densely. Smells like Cream of Wheat. This is great. I think I will add some straps or ties on the ends so I can hold it onto my head or neck. My husband will definitely use this too. Thanks for the great tutorial! We've been using an old sock full of wheat until I saw this! Just finished one with old sweatshirt material, wheat (we mill our own flour, so we had TONS of it on hand) and dried lavender from our garden. Its so nice and comfy I want it for me.... but my sis-in-law just had her appendix removed and it's a get-well-soon gift for her. My husband wants many many more though! Daughter will be making these for all her friends. Her friends range from 11-15 this will be a great second project. She made Kleenex holders for a part of the give away at her birthday. Great idea, I just made one for my father, it only took 2 hours, I sewed by hand and added mint tea also. What kind of fabric should you use? I used a home decor type fabric for this (a little heavier weight), but quilting cotton would also work! Natural fabric like cotton is best. Poly fabrics will melt with too much heat. Heating Pad works amazingly well. When gentle heat is applied on a painful area of your body, blood vessels in the surrounding area gets expanded and blood circulation is promoted. This provides additional oxygen and nutrients to the body cells, evacuation of waste products is eased, helps to heal the damaged tissue, relaxes muscles and brings you relief. When heat is applied to the painful and stiff joints, it increases flexibility of soft tissues, connective tissues, and muscles. Increases range of motion and brings you relief. Can I use vanilla extract with rice? What could you add to make them smell different? So they don't smell like that warm seed smell. I find it gross. Thanks! You can also use an old sock. Fill it with rice, corn or what ever. Tie a knot at the end and put it in the micro-wave. No sewing needed. Would red lentils work as a good filler? I'm making a heating pad for the first time, and wonder if this would hold the heat well or not. Any ideas and advice are welcome. Thanks! Goodness... I don't know. I haven't tried it myself, but I just read here (https://answers.yahoo.com/question/index?qid=20091010191729AAO1SS2) that the lentils get hot and hold heat the best... so I think it would be a safe bet! I have tried this out with white rice, pinto beans, and lentils. Lentils are by FAR my favorite. It has the best texture out of all three, heats up the fastest, and stays hot the longest. It also has a more pleasant smell than the pinto beans did. The rice has the most inoffensive odor, but I dislike the texture and it's the worst at retaining heat by a fairly significant margin. Hope this helps! Did you really microwave yours for 3 minutes? I did just 2:30 and it was burning hot. I know lots of microwaves are different... just thought you'd want to give a heads up on that. P.S. I found it hard to sew the sections without rice getting in between. Any tips on that? I did! But honestly, it's been almost 4 years since I posted this tutorial and we've moved several times in that amount of time, so I haven't tried it recently (with our current microwave). Also, I've thought about using a ruler to move the rice to one side or the other. Does that make sense? Something hard and straight to clear a path. Also, make sure you're not over-stuffing so there's still some room to move the rice over. Hope that helps! Why not use essential oils? Even the New York Times also named the graphical design of the game a real star. A great proof to its success can be seen from all the above statements. GTA 5 Torrent is a best you can download. Torrent GTA 4 also features an improved and expanded multiplayer mode. It is a full optimized the game to run smoothly on your desktop with great efficiency and without any lags or glitches. GTA V PC Torrent download form my website. Thanks a lot to share creative ideas. Download Appvn.apk on your phone with this LINK. appvnapkdownload that feel free to tell us in the comment area listed below. Do not stress as well as uninstall your songs and video How to use Root Explorer App which was so good, that it made me remove my default data manager. Thanks for the post. I think I'll try this, but was wondering if anyone has had any problems with lentils, rice or other dried food going rancid/bad?